The aunt of toddler Inaya Ahmed has compared the impact of her death on the family to an "earthquake". Nadia Ahmed, 44, was giving evidence for a third day at the trial of her sister-in-law Sadia Ahmed, 28, at the High Court in Glasgow. 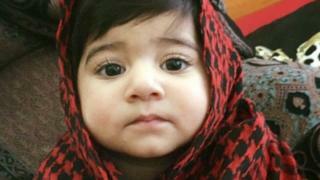 Sadia Ahmed denies murdering 14-month-old Inaya by placing a cushion over her face or shaking her by the body. The offence is alleged to have taken place at the family home in Drumchapel, Glasgow, in April last year. Inaya was taken off life support three days later at the Royal Hospital for Children. Describing the impact of the toddler's death, Mrs Ahmed said: "Everybody was shocked. "It looked as if everyone had frozen. "They were all going through a terrible time. "It was the same as an earthquake." Mrs Ahmed was asked why she had told police in a statement that Inaya's mother was good with her. She replied: "She had no love in her heart for Inaya, but in front of me or in my presence she did not harm her." The witness claimed Ahmed showed more love for a little baby boy in the household and added: "She should have had that love for Inaya. "From day one when she found out she was going to have a girl she was not happy. "She wanted to abort the child and have a son." Earlier, Mrs Ahmed told the jury Nadia Ahmed confessed to her that she put a pillow over Inaya's face. The court heard Nadia Ahmed and other members of the family stayed at Mrs Ahmed's home for three weeks while police were searching the house along the road. Defence QC Ian Duguid asked Mrs Ahmed: "According to you, you were living for those weeks with a cold-blooded killer in your bed you can't have been very pleased about that?" She replied: "Obviously when they were staying at my house I could not have asked them to sleep in the shed." Mrs Ahmed was then asked why she allowed her own daughters to sleep in the same bedroom during these three weeks with "a cold-blooded killer". She replied: "I, myself was not stable at the time. "I didn't know what I thought. "Today sitting here I can't think what I was thinking a year and a half ago." Mr Duguid accused Mrs Ahmed of lying by claiming that Ahmed had told her she smothered Inaya. But the witness denied this and said: "I'm telling the truth."